"I like cattle and sheep- it's what I am used to"
Farmer’s wife Jean Fowler knows her livestock and has used her years of working with them to create bespoke animal sculptures. Kate Chapman finds out how she has made a name for herself from Northumberland to New Zealand. A lifetime living in the countryside and working with livestock has given farmer’s wife Jean Fowler the perfect foundation from which to create her own range of beautiful animal sculptures. 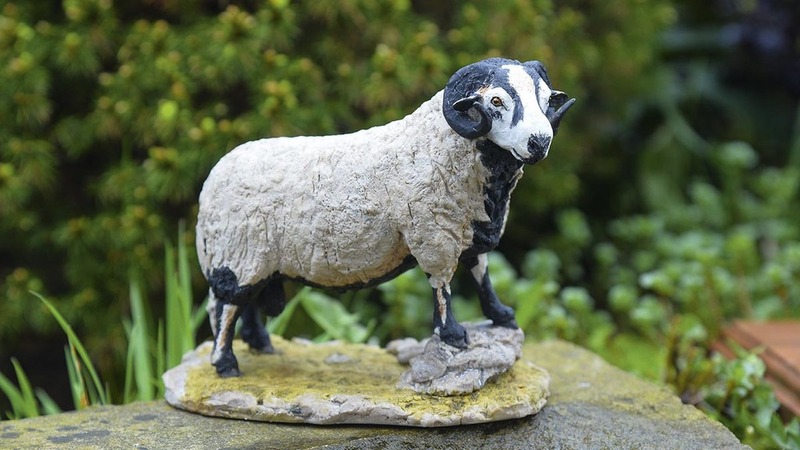 Every model the grandmother-of-three creates perfectly captures the likeness and form of her subjects and it is her attention to detail which makes her work so popular with farmers and breeders worldwide as they seek a lasting reminder of a favourite, show or sale winner. Jean launched Castle Sculptures – named after the ruined castle on the family’s farm – back in 1998 after making a model of one of her own pedigree cattle and was soon inundated with requests from friends, neighbours and fellow farmers asking her to recreate the likeness of one of their favourite animals too. 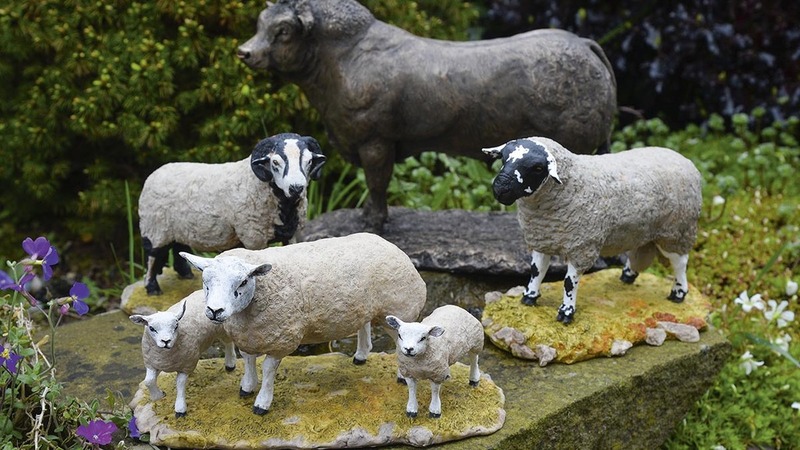 Now almost 20 years later she has built up a collection of more than 40 different pieces – including cattle, British sheep, continental sheep, horses and dogs – which she is able to personalise for customers by painting them to match their own animal’s individual colours and markings. Jean sells her work at a small number of shows and sales throughout the year, as well as through her website and Facebook page, while some of her pieces have been presented to royalty and show winners. “I’ve always been interested in art and wanted to have a go,” says Jean. “But it was years ago, when we used to breed Blonde d’Aquitaines, I always fancied owning a model of one, but thought at the time the Border Fine Arts were too expensive for me, so I decided to make my own. “I started off with that, then a next door neighbour who kept sheep asked me to do one of his flock and then someone else asked me to make a Swaledale, and it’s just gone on from there. It all started off as a hobby, but people kept asking for different things. “I get a lot of requests for tractors, but I say no to those – I’m not interested at all in tractors. I like my cattle and my sheep – it’s what I am used to. Jean farmed alongside late husband Bill, looking after a dairy herd of 120 Friesians, 100 Mules and a small herd of Blonde d’Aquitaines on 60 hectares (150 acres) at Castle Farm, near Garstang, Lancashire, until retiring about 17 years ago. Her eldest son Daniel looks after the farm now, while his brother Simon works for an animal pharmaceutical company. Before she married, Jean worked in an engineering drawing office and later as a clerk at an auction. She also ran a successful B&B in the farmhouse for more than 15 years and was chairman of the Lancashire group of the Farm Holiday Bureau (now FarmStay). A keen sketcher and painter too, she decided to pursue her interest in art by taking a one morning a week sculpture class. “If you work in proper clay it has to be fired and this process blows out the detail. If I put in fine hair strokes for example, when the piece is fired they disappear, so I work in oil-based clay which doesn’t dry out,” she explains. “Before I start I make an armature – an open structure around which the model is made – like fibre glass rods up the legs to hold the weight of the clay. If there’s no framework it will just collapse, so I build the piece around that and then carve into it. She sends the finished model away to Lakeland Mouldings which makes the moulds. They pour a thick resin inside before it gets shaken about to take the air out and then it solidifies. Only one can be cast a day. Jean, who uses her summer house as studio, paints her pieces with standard markings appropriate to each breed, but can also customises them to individual’s requirements. In order to achieve such lifelike results she draws on her own years’ of experience working with livestock and consults breeders, often travelling many miles to view their pedigree stock first-hand. Many of her works focus on minority breeds such as the Hill Radnor ram and she also uses photographs to help her achieve the right look for finished pieces. “People send me photographs for me to use when painting, but when making a piece from scratch, working off the photos you cannot see all the lines and the form, so I do travel to see the animals. I’ve visited sheep in Scotland and Beef Shorthorn show cattle in Peterborough – I’ve travelled all over. “It’s very important it’s right. Breeders are very particular about the lines of the animal, how they’re standing and their markings. The wooden bases which her pieces stand on are made by a local joiner and stained and varnished by Jean herself. Many of her models are limited editions and come complete with a numbered certificate of authenticity. Each one is also inscribed with her signature and a small ‘Castle’. Prices for her work vary, with smaller pieces selling for about £45-£50, going up to £165 for larger pieces such as a cow and calf together. Although she has never been abroad herself, Jean receives requests for her models from around the world and has sent them as far afield as New Zealand, Lithuania and Norway. As well as making the perfect gift for animal lovers, her models have also been used as trophies and one was given to Prince Edward during his attendance at the Royal Lancashire Show. Last year she was asked to provide seven Limousin bulls to be presented to the host farms at a world livestock conference. Jean is taking a break from shows this year as she is due to have a knee operation, but says seeing her work in the flesh is really the best way to appreciate it. “Seeing them first-hand is best – that way people can see the quality and craftsmanship close up. They are lifelike pieces – there’s a texture to them, they are not smooth like fired pottery. “I’ve been doing this about 25 years now, I suppose I just thought I should give it a go, rather than wondering what if and it’s really taken of. “I’ve met some really nice people along the way and it was my salvation when Bill died four years ago as I had orders to complete and events coming up. Without it I would be completely lost. “My mother, who is 92, keeps asking me when I’m going to retire, although I want to slow down a little as there is only me doing it and it can get quite frantic sometimes. For more information about Jean’s work visit her website www.castlesculptures.co.uk or search for Castle Sculptures on Facebook.